Time to go the Farmer's Market! The first place you go when you need to save the trees in an underwater city! If you have a phobia of bees, turn back now. I tried to make this work! Time to save these underwater trees! This makes sense in context of this game! Something weird happens in this one! Let's Frolic through the Fort! Alternate titles I had for this episode included "Ice Ice Maybe" "Cold as Splice" "The Splice Age" and "I know most of this video doesn't take place in the ice area but that's the main thing you will remember probably"
I'm glad I could think of that title. Also, I think this is the one where I have some really stupid deaths. 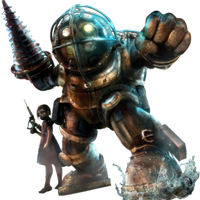 Amazing timing as Bioshock was released exactly 10 years ago! Well, time to finish up Sander Cohen's "art". A strange volcanic powered area. A strange ability to tolerate bullets via wearing a welding mask. Strange corpses. STRAAAANGE THINGS ARE HAPPENING TO ME. Strange random references to Toy Story. Well, we gotta get that door open somehow. Now with twice the commentators! ...again. Would you kindly watch this video of mine?